Slow Food Anglia was very pleased to have held its first food festival in Colchester, Essex last weekend, Saturday 5th and Sunday 6th September,the event proved to be extremely popular and well received by the public who attended in large numbers over the two days that it took place. Being the first festival of its type to be held by Slow Food in Anglia we were not sure how many members of the public might attend, but in the end we believe several thousand visitors came on each of the two days that the event was held. 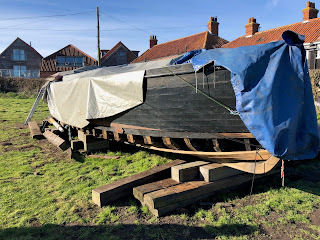 We were first approached to explore the idea of holding a large food festival last spring and this fitted well with our plans for the new Slow Food Anglia region which had been created in the autumn of 2014 to encompass Slow Food groups in the east of England. The new Anglia region was formed to promote, support and work with the existing Slow Food groups in Norfolk, Suffolk and Essex as well as working with Slow Food members to open new groups in Kings Lynn in Norfolk and in the city of Cambridge in Cambridgeshire. Slow Food anglia è stata lieta ditenere il suo primo food festival a colchester in Essex lo scorso weekend, Sabbato 5 e Domenica 6 Settembre. L'evento è stato un successo ed è stato molto ben ricevuto dalla comunità locale che è accorsa in numeri di gran lunga superiori alle aspettative durante i due giorni della manifestazione. Essendo stato il primo festival di questo genere ad essere organizzato da Slow Food in Anglia non eravamo certi della risposta di pubblico ma alla fine migliaia di persone sono intervenute per giorno superando ogni nostra spettaativa. La location scelta per il festival è stato il Lower Castle Park nel centro della città e l'organizzazione logistica è stata sovrintesa da Don e Terry di Food and Drink Festivals UK. Siamo stati inizialmente contattati per esplorare l'idea del festival la scorsa primavera e si è subito accordata bene con i nostri piani di lancio per questa regione dove il nuovo gruppo di Slow Food anlgia è stato creato lo scorso autunno 2014 per inglobare e coordinare al suo interno tutti i gruppi presenti nella zona. In particolare gruppi già esistenti Slow Food in Norfolk, Suffolk ed Essex così come per lavorare con le comunità locali alla creazione di nuovi gruppi a Kings Lynn nel Norfolk e nella città di Cambridge nel Cambridgeshire. One of the main aims of the festival is to promote the Native Colchester Oyster to a wider public and to get the oyster recognised as a Presidia food, thus joining the other two Presidia in the UK and in excess of 450 Presidia foods worldwide. Don Quinn from Food and Drink Festivals UK is a keen supporter of the Colchester oyster and has also written a book on how to cook them, he also took part in a joint cookery demonstration with Malcom Long the local chef from Colchester. Over the summer producers and stall holders were approached across East Anglia to invite them to take part in the event and Slow Food in both the Marche region of Italy and Sicily were very supportive of the concept of a joint Slow Food festival in Colchester, they were also very happy to have some of their members invited to participate as well. Uno dei principali obbiettivi del festival è stata la promozione delle Native Colchester Oyster ad un pubblio più ampio possibilee di lavorare per ottenere il presidio Slow Food in aggiunta agli altri già presenti in Inghilterra e nel mondo. Don Quinn di Food and Drink Festivals UK è un forte promotore delle ostriche di Colchester e durante il weekend del festival ha presentato il suo libro in materia e si è unito allo chef locale Malcom Long durante una delle domostrazioni di cucina in programma. Durante l'estate sia produttori che espositori sono stati approcciati in tutta la regione dell'East Anglia e sono stati invitati a partecipare e delegazioni di slow Food dalla Sicilia e dalle Marche si sono unite con entusiasmo a noi con rispettive delegazioni di membri presenti con stand dei loro prodotti e presidi Slow Food. 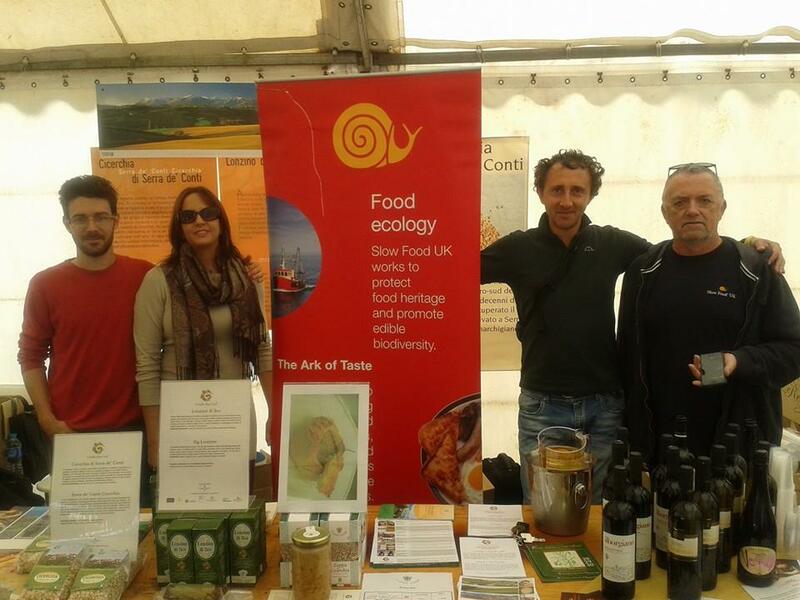 We were very pleased to have Ugo Pazzi the President of Slow Food Marche come to the UK to attend the event and meet members of the Slow Food Anglia group as well as producers from our region. Marco from a small food and drink co operative, La buona Usanza, in the village of Serra di Conti in the Marche region also came to the UK and he had a selection of Presidia foods with him, which proved very popular with the public. Enrico from the il Molo di Portonovo restaurant in the resort of Portonovo in Marche also came from Marche to England with Ugo and Marco and he took part in the cookery demonstrations and master classes over the two days of the festival. The mussels from Portonovo were showcased by Enrico and the other chefs at the festival and also the Marche region was promoted by the dedicated team which was also present at the event. Siamo stati molto lieti di avere Ugo Pazzi, presidente di Slow Food Marche presente nei due giorni ad incontri con membri del gruppo Anglia così come produttori della nostra regione. Marco dalla cooperativa La Buona Usanza a Serra dei Conti, nelle Marche, era presente con due presidi, la cicerchia ed il Lonzino di fico, ed entrambi hanno riscontrato un ottimo interesse da parte del pubblico. As well as the Slow Food members from Marche we also have the well known Sicilian chef Enzo Oliveri take part in the cookery demonstrations and master classes, Enzo is well known for the wonderful Sicilian dishes that he has prepared for clients throughout the world. With him was a small team from Tasting Sicily promoting typical Sicilian products and allowing visitors to try typical foods from that part of Italy.Slow Food Sicilia also has close links with the Slow Food Anglia group and we are now working with both the Marche and Sicilian groups to hold a joint festival with them next summer as well as having them come to another Slow Food festival in Colchester next September, we also hope to hold another festival in the beautiful city of Norwich in Norfolk in the spring. Finally we are currently exploring plans to hold a large Slow Food festival in central London next year, this would be in one of the well known and prestigious venues that already host world famous food and drink festivals and events each year. Insieme alla delegazione di Slow Food Marche, ne abbiamo avuta una altrettanto nutrita dalla Sicilia che ha incluso il noto chef Enzo Olivieri che ha preso anche lui parte ai due giorni di dimostrazioni di cucina. Enzo è riconosciuto ed apprezzato chef per la sua cucina tipicamente siciliana che prepara regolarmente per una clientela internazionale nei suoi ristoranti. Insieme a lui abbiamo avuto il team di Tasting Sicily promotrice ufficiale dei prodotti presidio Slow Food siciliani in Inghilterra. Slow Food Anglia ha stretti legami di collaborazione anche con Slow Food Sicilia e stiamo ora collaborando con entrambe queste regioni d'Italia per la realizzazione di un festival la prossima estate così come alla loro partecipazione allo Slow Food Seafood Festival a Colchester il prossimo Settembre. Stiamo inoltre lavorando alla possibilità di avere un altro festival anche a Norwich nel Norfolk la prossima primavera.